Not all fields are created equal. Some will have nice even, clean stands and some will have weeds, washouts, overgrown waterways, lodged corn, and areas where the crop is missing. It is in these challenging situations where GPS fusion engages to keep you in the correct row. 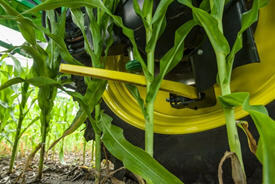 With AutoTrac RowSense, the row sensors are the first priority when it comes to guiding the machine down the row. As long as the sensors detect the corn plants these inputs will be provided to the AutoTrac system and the machine will follow the row. In other instances, where the sensors are not detecting crop rows due to excessive weeds or missing plants, the system will quickly switch to GPS-only guidance until good, stable rows are detected again. 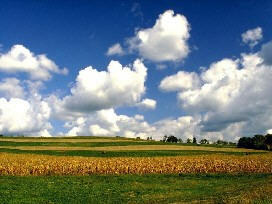 For example, crop stands following a wet spring may have uneven stands and areas where the corn was drowned out. While spraying, as the machine crosses into the washed out areas the system will detect that crop is missing and will quickly switch to GPS-only mode to guide the sprayer across the troubled area and into the correct row on the other side. When harvesting and crossing a passable waterway, the system will behave similarly guiding the combine or self-propelled forage harvester (SPFH) into the proper row on the other side. In either situation, staying on the correct row maximizes efficiency in the field. GPS fusion ensures the operator follows the correct row even when conditions get tough. Planting using automatic guidance provided by integrated AutoTrac™ steering system, AutoTrac Controller or AutoTrac Universal. 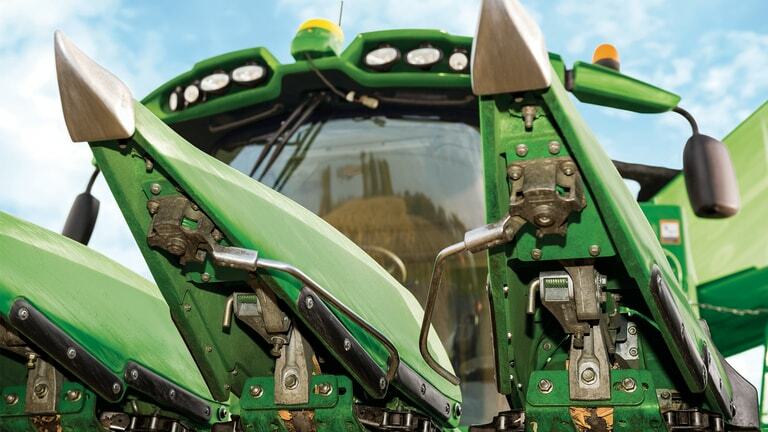 Turning the implement steering mechanism with the fingertip controls while using Active Implement Guidance (AIG). Harvesting with a combine, self-propelled forage harvester (SPFH), self-propelled sprayer equipped with AutoTrac RowSense™ software. All of these benefits result in more uptime for the equipment and an operator who is more alert throughout the day. Producers work too hard to grow quality crops to afford to leave any of that yield potential in the field. 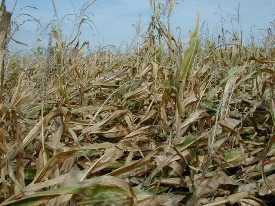 However, while spraying and harvesting standing corn, yield limiting damage or losses can occur. 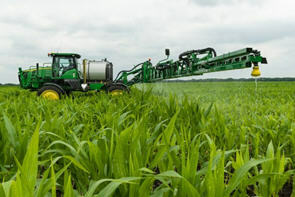 When spraying, some operators may choose to cross crop rows to simplify spraying and reduce stress. However, this method of spraying can damage more the 2 percent of the plants in the field. 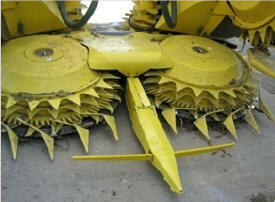 To improve yields, the operator will follow crop rows to reduce this damage. In this instance, keeping the sprayer’s wheels in between the corn rows is important to ensure that plants are not damaged and can reach their full yield potential. Unfortunately, with so much going on in the sprayer cab during long days, a small lapse in attention can result in significant crop damage. For example, an operator spraying at 24.1 km/h (15 mph) who is misaligned with the row for 1 second could damage more than 90 corn plants. During the course of a day, a few minor misalignments could lead to major damage. With AutoTrac RowSense the operator can be confident that the sprayer is staying in the row, even if he cannot physically see the sprayer wheels. When harvesting corn for grain, misalignment with the row can cause corn ears to be thrown away or bounce out of the corn header resulting in header loss. AutoTrac RowSense can keep the combine or SPFH aligned through varying field conditions to make sure your grain gets from the field to the grain tank and truck. 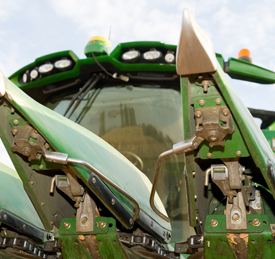 Ag service providers and contractors see benefit in AutoTrac RowSense by ensuring that they complete jobs to the highest quality level possible, regardless of operator experience level. With this technology, their operators can feel confident in knowing that the job will be completed with minimal damage or losses. Anyone who has spent a long day spraying fungicide in July or harvesting corn in October knows how stressful it can be to stare forward out of the cab and focus on the corn row ahead. 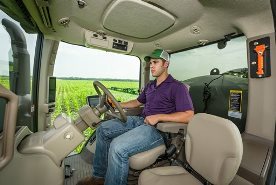 On top of steering the machine an operator is required to monitor machine performance, spray rates, manage grain handling or tender trucks, and monitor grain or forage quality all while watching for part failures and maintenance issues. Operating at night, in windy conditions, or while harvesting lodged corn can add even more stress to the operation. A study using advanced, eye-tracking glasses determined where an operator’s attention is focused while operating a sprayer through tall, standing corn. When AutoTrac RowSense is utilized, an operator spends approximately 13 percent less of their time focused on steering the machine and more time watching sprayer booms and monitoring machine performance on the vehicle display. 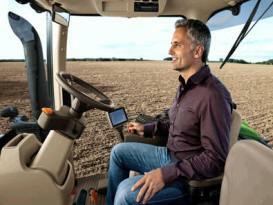 AutoTrac RowSense focuses on steering so the operator can focus on the crops. Getting more work done in less time is the name of the game for progressive producers, ag service providers, and custom harvesters. One way to do this is to make sure equipment is operating at the optimum operating speed as much as possible. While operating a self-propelled sprayer, consistent, optimal operating speeds lead to covering more acres per day. This means more revenue for ag service providers and more timely chemical applications within narrow windows for producers. Also, driving at a consistent speed is critical for applying accurate chemical rates across the entire field for more effective applications. With RowSense driving the sprayer through the row, even in varying field conditions, operators of any experience level will be able to the maximize productivity and efficiency of product applications. 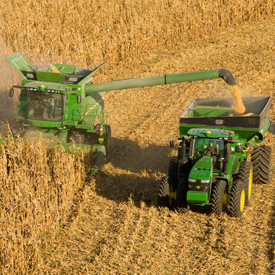 During corn harvest, either with a self-propelled forage harvester (SPFH) or combine, maintaining a consistent crop flow is critical for getting the most efficiency and highest quality product. However, while traversing waterways, while harvesting at night, or at the end of a long day this can be difficult to do and stay on the correct row. In lodged corn the RowSense sensor detects the crop stalk close to the ground and below the typical breaking point following high winds to make sure the operator stays on the correct row and maintains speed. With AutoTrac RowSense steering the combine or SPFH the operator can make sure machine settings are optimized for maximum throughput and can focus on loading the machine to capacity.